It's been about two years since a Micron TransPort notebook computer weighed in at less than 7 pounds. So I welcomed the 5-pound TransPort LT, among the first in the company's refreshed line. It puts Micron PC Inc. in the lightweight, full-featured notebook market with Dell Computer Corp. and Toshiba America Information Systems Inc. Besides the TransPort LT's dual-spindle design, solid performance and attractive appearance, it can integrate a 56-Kbps modem and 10/100-Mbps network interface card, although my test unit lacked the latter. The unit has one truly annoying quirk: the power button. When it was pushed, the power indicator sometimes lit up although the power-up process never began. The display illuminated, but nothing ever appeared on it, and the hard drive wouldn't spin. When I pushed the power button off, the power light went off. When I pushed the button on again, the light came on again, but nothing happened. Even a press and hold'sometimes required for advanced power management'wouldn't work once the TransPort got caught in this cycle. A recalcitrant power button is a disappointing feature of the otherwise powerful and lightweight Micron TransPort LT. The only way to bring the unit to life was to disconnect the unit from AC power, remove the battery and start over. Sometimes the notebook turned on properly after a power source was connected. I understand the need for power management in portable computers. But notebook makers'not just Micron'should stop trying to force the power button to also suspend a portable in sleep mode. Whatever happened to good, reliable switches whose only job was to turn a system on and off? Speaking of power, the TransPort LT is among the first notebooks I've examined with Intel's SpeedStep, a battery-saving technology that Intel designed for its portable processors. The LT's Pentium III processor runs at 600 MHz while connected to AC power. When running from the battery, the processor clock rate steps down to 500 MHz. That 100-MHz difference could make a slight difference in battery life, but I saw none. Under the GCN Lab's maximum drain test, the battery lasted about 1.5 hours whether SpeedStep was enabled or not. For more powerful processors, SpeedStep might make a difference. The GCN Lab will test other SpeedStep notebooks with faster processors later this summer. The overall grade comprises scores for three factors: usability (60 percent), features and configuration (20 percent), and performance (20 percent). The lab used ZD's Winstone 99 Version 1.2. The baseline 10.0 Winstone unit is a 233-MHz Pentium MMX. For benchmark information, go to www.gcn.com/gcnlab/benchmark. The TransPort LT's lithium-ion battery weighs 13 ounces. That means for every ounce of battery, the TransPort LT works for almost seven minutes. That's a little on the low end'but acceptable. Of course, most of the battery power is dedicated to the bright, 13.3-inch active-matrix display, the speedy 11G hard drive and a DVD-ROM drive. If you plan on watching a DVD movie in flight, make it a short feature. The DVD software shuts down when there's 25 percent of battery charge remaining. I never managed to get through a whole movie. The DVD module can be swapped for a floppy drive on the fly. Micron includes a software applet for switching without rebooting. The TransPort LT's benchmark results were strong, even with the processor clocked back to 500 MHz. On the Ziff-Davis Benchmark Operation Business Winstone 99 suite, the TransPort LT earned a score of 23.7 at 600 MHz and a 20.7 at 500 MHz. The GCN Lab recently examined a notebook with a 500-MHz processor [GCN, June 12, Page 28]. In fully powered mode, it earned a 16.1 on the same tests. The TransPort LT's $3,216 price tag is a little high, considering that current top-of-the-line SpeedStep processors run at 750 MHz. 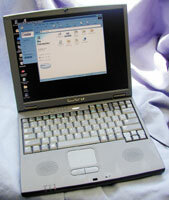 Overall, the TransPort LT signals a significant improvement in Micron notebooks. That's partly because the company has switched original equipment manufacturers. It's good to see Micron offering a notebook worth serious consideration. It's even better to see one that doesn't weigh much but still has everything a mobile user needs.